The goals of Patient’s View are to identify quality and safety issues through the eyes of patients and families – often problems that the care team may be unaware of – and to use the information to inform improvement initiatives. 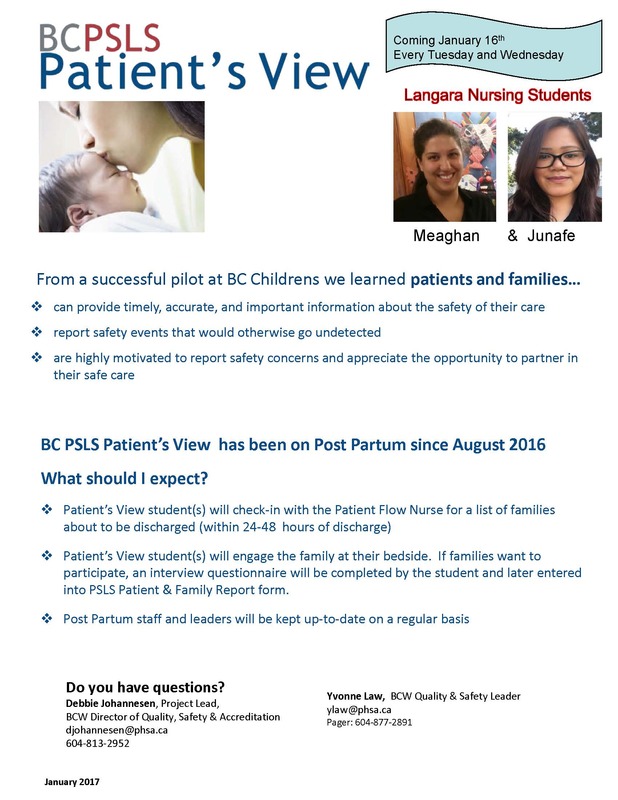 BC Children’s Hospital led the way with a pilot of Patient’s View in 2012 and now this successful initiative has spread to BC Women’s Hospital (BCW) and Vancouver Cancer Centre (VCC) through collaboration with the Langara College nursing program. The original model for Patient’s View developed at BC Children’s deploys specially-selected and trained volunteers to interview patients and families at the bedside and collect their observations about the quality and safety of care during their stay. Debbie Johannesen, Director of Quality, Safety and Accreditation at BCW, Tracy Lust, Quality, Safety and Accreditation Leader at VCC and Yvonne Law, Quality, Safety and Accreditation Leader at BCW say that expanding on the original approach by inviting nursing students to participate in Patient’s View has been an excellent way for their organizations to launch the initiative. 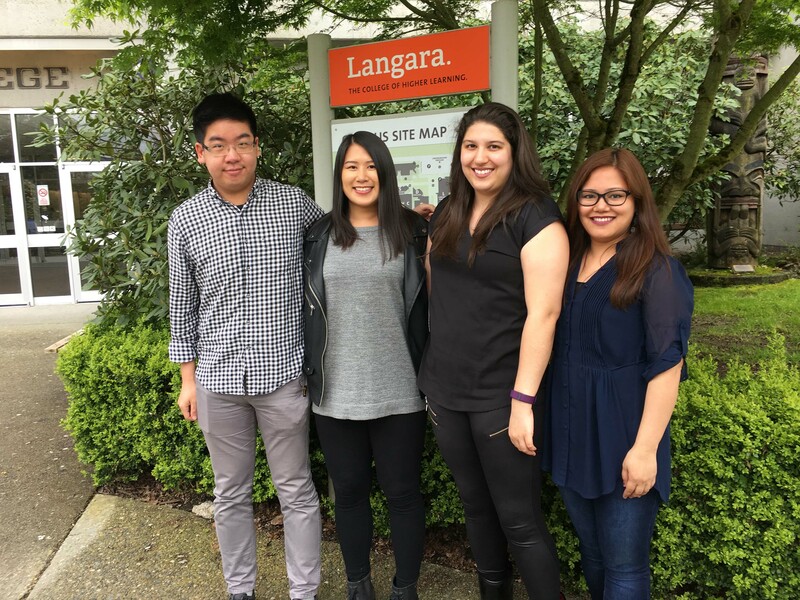 The Term 8 practice course in Langara’s nursing program brings fourth-year students and agencies together to work on a particular project. Veryl Tipliski, Langara Term 8 Coordinator, says Patient’s View was the perfect fit and four students jumped at the opportunity to participate, recognizing that Patient’s View would help build their confidence when speaking with patients and families and broaden their understanding of patient safety in a real-life health care setting. At BCW, two students worked side-by-side and met with new parents just prior to discharge. For Meaghan Monroe and Junafe Tongawan, Patient’s View taught them that patients and families are a valuable resource when it comes to understanding and improving quality and safety. At VCC, William Siy and Rebecca Lin conducted their interviews individually and met with patients who were at the clinic for cancer treatment. They believe Patient’s View helps to build trust and rapport with patients. “Sometimes our conversations with patients were quite informal, which was nice,” says William. “The entire Patient’s View experience was extremely worthwhile and I will always keep this with me as I move forward in my nursing career.” William is completing his preceptorship at Vancouver General Hospital. Both BCW and VCC are using the information collected through Patient’s View to identify opportunities where quality and patient safety could be improved. Future plans are to rollout Patient’s View to BC Mental Health and Substance Use Services (BCMHSUS). 1. Engage with patients. Ask them about their experience and if they have any safety concerns. 2. Keep in mind that most feedback from patients and families is positive. 3. Problems with communication are most common. How can your team communicate more effectively? 4. Patient’s View volunteers should wear special lanyards or other identifiers and/or carry identification with them. Debbie Johannesen, Tracy Lust and Yvonne Law would like to thank Langara College for its commitment and support of Patient’s View. They look forward to working together again!